The Champions League has returned and dropped one hell of a quarter-final on our doorstep. It promises the be an emotional night for many of the participants whether because of our last meeting in this competition, or because of their history playing for Arsenal. Some of the Villareal players will be desperate for revenge after missing out on an all-spain final thanks to Lehmann’s penalty save late in the second leg. Some of the players will be looking to make Robin Van Persie eat his words. Last week he was quoted as saying that we should beat Villareal. He may be right, but you simply can’t be quoted saying that. Ironically, he’ll play no part in tomorrow’s fixture. 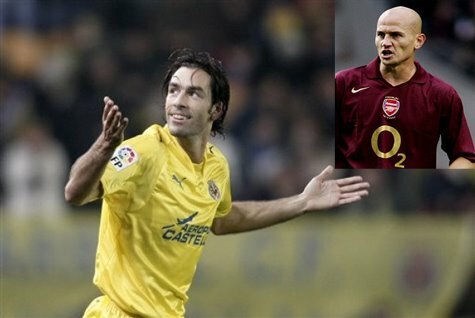 And then there’s Robert Pires and Pascal Cygan. For these two former Arsenal players, it will be an interesting assignment. It can’t be easy going full bore ag ainst the team you held so dear, but I doubt very strongly that we’ll see any less than their best effort in this tie. Pires is one of my favorite Arsenal players thanks to his wonderful skill and professional attitude. If we were not participating in the competition at this stage, I would certainly be rooting for him to succeed. As it stands, he is our mortal enemy for two matches. I’m very interested to see how he reacts in a fortnight to playing in front of the Emirate stadium crowd. It’s not quite the cozy surrounding of Highbury that he left behind. Pires and Cygan are an interesting side story to this match-up, but their presence should not distract this current crop of Gunners from going about their task with vigor. The injury news is not entirely surprising. Wenger will be disappointed that Van Persie is not available for the match, but I think that Samir Nasri’s participation is actually more important at the moment. Without Nasri, we don’t have reliable cover for the left side of midfield. Denilson has been poor in his few cameos playing on the wing, which means that Bendtner would have had to deputise on the left side of midfield once more. Nasri’s return to health means that we can play the identical formation that Wenger employed versus Citeh. Samir simply replaces Arshavin who is, of course, cup tied. I said previously that it’s not my favorite formation for our attacking players, and that I much prefer a 4-4-2, but Arsene has eschewed the 4-4-2 in Europe all season long, so it was always unlikely that we would see two strikers at the Madrigal. My only real concern tomorrow is that the match has come so soon. I woke up today still feeling a hang over from the tedious international break and we’re already on to our second match since it ended. Adebayor is now playing his third match in a week, after just returning from injury. Gallas and Sagna are playing their fourth match in ten days time. Walcott is battling leg injuries and Fabregas had only 72 hours to rest after playing his first match in four months. Fortunately, Song and Denilson should be reasonably well rested and Nasri played a few scarce minutes for France ten days ago. Overall, we’ll need an energetic performance, and I’m hopeful that this group has enough fuel in the tank to produce. It may sound strange, but Cesc’s injury may well have been necessary. I remember watching Henry look so out of sorts in his final season with Arsenal. He lost a lot of time to injury that season, but when he was healthy, he never really hit the high notes. That was the season that immediately followed France’s run to the World Cup Final. Henry had literally no rest for a year. Cesc started this season in similar style. Spain won the European final, and Cesc went almost immediately from international duty to club football. He started the season in modest form by his illustrious standards and then suffered the injury that has kept him out until Saturday. Ultimately, the rest may have done him a power of good. I have a feeling that we’ll be seeing his best form return as we head into some of our most important fixtures. Also, the absence will have made him voracious for football once more. It’s also worth noting that he was really just a football infant when he played with Pires. He might be eager to show Robert just how much his game has developed in the last few seasons. I think his assement is just about perfect. There was a huge degree of misfortune and crap refereeing that cost us that tie. But it’s also a cautionary tale for the Villareal encounter. Being the better team over two legs doesn’t get you to the next round. Winning does. And the best way to win a Champions League tie is to score away goals. We will be fielding a strong starting XI tomorrow but there might be some rust on a few of the players. It will be absolutely critical that we show urgency. If we can put Villareal under pressure early, we may be able to kill of the tie tomorrow. Their confidence will be suffering after a humiliating 3-0 defeat at mid-table Almeria at the weekend and the loss of Santi Cazorla to a fractured fibula. Marcos Senna is fit for the match which will buoy them, but they have their defensive problems and we need to exploit that for at least one away goal. Hopefully Adebayor doesn’t become stranded playing all alone up front. He will need support from Nasri, Cesc and Walcott (or Eboue). In some previous matches where Adebayor has been deployed as a lone striker, there has been a dearth of clear scoring chances. He likes to pop-up on the wings and come back to midfield at times, which isn’t helpful when there’s no other striker attacking the box. Since he’s almost certain to be assigned the lone striker role tomorrow, he will really have to put the Villareal back four under pressure through the middle and over the top. Villareal conceed three goals at the weekend all created by crosses into the box, so that’s where we will need Adebayor to be at the critical moment. It sounds so obvious, but doesn’t always work out that way. At the back, we can certainly contain Villareal but they have real scoring threats in Rossi and Llorente. The one advantage for the yellow submarine is that their 3-0 half-time deficit allowed them to pull both strikers off the pitch on 55 minutes. They should be ready to go tomorrow. Sagna should have the confidence to deal with Pires who certainly won’t run past him, but I have to admit, the thought of Clichy in his recent form taking on Cazorla had been worrying me. I think Gael has caught a very lucky break (no horrible pun intended) with Santi’s injury. Villareal are not setup to play for a scoreless draw. They have had only one scoreless draw in the Primera this season. In the Copa Del Rey they were knocked out in their first appearance 6-1 on aggregate by some team called Club Polideportivo Ejido. It doesn’t matter who was playing, that’s just down right embarassing. But their defense has been stingier in Europe. In the Champions League Villareal have three scoreless draws. The first was against Celtic at El Madrigal, and then Manchester United…twice. Regardless, I find it hard to believe that we’ll be taking penalties in a fortnight’s time with an aggregate score of nil-nil. Villareal have conceeded nine goals in the Champions League this campaign with places them 6th of the eight remaining teams. Their 12 goals scored are tied for fourth with Chelsea and Arsenal. Somehow, tiny Aalborg managed to score five goals against Villareal in their two matches. That makes it even more remarkable that United were unable to find the back of the net in either fixture. In the last round, Panathinaikos managed a single goal in both legs, while Villareal netted twice and once respectively. That sums up their European campaign to this point. What concerns us now is what happens from here. It’s a very important match tomorrow, but for more reasons than the obvious. Arsenal are on a fantastic run that dates back to November. But realistically, there have been bad performances mixed in. We’ve had some terrible draws and did, in fact, lose to Roma in the second leg of that tie. Recently we’ve been on a torrid run. We’ve won four league matches in a row, seven overall domestically, and have seen some of our most influential players start to return. But it’s all happened against admittedly modest opposition. Cardiff, Burnley, Hull, West Brom, Blackburn, Newcastle and Man City are not top sides. We’ve done to them, what we should do to that caliber opposition. The real question is whether we are as good as we all believe we have become. That can only be proven against tough opposition and that’s exactly what we’ll meet on the pitch tomorrow. We go into the match with confidence and boosted by the return of our captain. I genuinely believe we have a strong performance in store for Villareal provided the players play with the freedom we have seen of late. Denilson will have to be careful not to give away silly fouls. Adebayor will have to show the application that we saw against Citeh. Cesc, well … Cesc will be Cesc. And if Theo or Nasri can provide some decent service into the box, there are goals to be had, as Villareal’s performance at the weekend suggests. I like our chances tomorrow to get the goals and take a lead back to the Emirates. I just hope the players don’t step on to the field with the attitude that all they have to do is show up. Somehow, I don’t think Cesc will let that happen. Especially in his native land. It was an eternity for Arsenal football to return from the break, now it’s come back with a vengange. Fingers crossed for a memorable European night tomorrow.